(Nanowerk News) Modern glass façades inform the architecture of major cities throughout the world. In recent years, however, there have been cases of broken glass, with collapsing façades endangering passers-by. Now, a special sensor can detect micro-fissures and warn of impending breakage beforehand. The sensor is located on the rim of the sheet of glass. It is linked to the building control systems by cable. The Pompidou Center, the pyramid entrance to the Louvre, the Munich Uptown tower and Berlin‘s Spreedreieck office triangle: When constructing modern buildings, architects readily choose constructions designed of glass and steel. Nowadays, entire glass façades are no longer a rarity. Meanwhile the constantly recurring reports of collapsing façade elements have prompted the federal ministry for transportation, construction and urban development to mandate regular inspections of potential risk. The problem: The monitoring instruments in use until now merely register the sound of breaking glass. Thus, they can only ascertain breakage once it has occurred, and are unable to warn of looming peril in a timely manner. Researchers at the Fraunhofer Institute for Silicate Research ISC in Wurzburg in collaboration with industry partners have developed a sensor that even detects micro-fissures of five millimeters in length, and thus point out the need for repairs early on – long before the glass actually breaks. 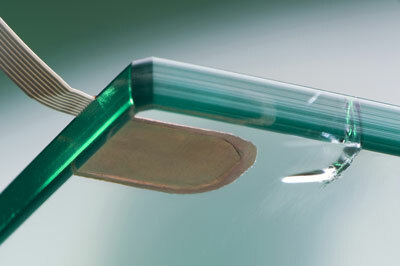 »We attached several piezoelectric sensor actuator modules in a window pane. Four sensors are situated on a one square meter surface, on the edge of the pane at a distance of one meter from each other. One sensor actuator module produces an ultrasound wave that is registered by the others. If the acoustic signal remains constant, then the pane is not defective. If it changes, then this indicates a fissure caused during transport or due to an installation error. This fissure most often emanates from the edge of the pane and is initially invisible. It is only as time goes by that it gets larger due to various factors, like fluctuations in temperature,« explains Dr. Bernhard Brunner, working group manager at ISC. The sensors are linked to the building control systems by cable. The data received there is analyzed automatically. If a fissure occurs, an alarm goes off. »We have succeeded in integrating our sensors, which measure 15 by 15 by 0.5 millimeters, into laminated glass. They can be integrated between both glass sheets as early as the manufacturing process. Therefore, the sensors can test the glass for transport defects even before installation,« adds Brunner. Glass manufacturers and glass refiners also have the opportunity to conduct tests when goods are received or shipped. Yet the new safety system not only warns of glass breakage; it also offers comfort functions: The sensor-actuator modules are coupled with temperature and light sensors that – depending on incident light – target individual louvers for opening or closing, and thereby control room temperature. Currently, the project partners are looking for façade builders who want to use the sensors on a test basis. The experts are displaying a prototype at the Sensor+Test trade show in Nuremberg from May 18 to 20 (Hall 12, Stand 202).